← Are There Real Superheroes? 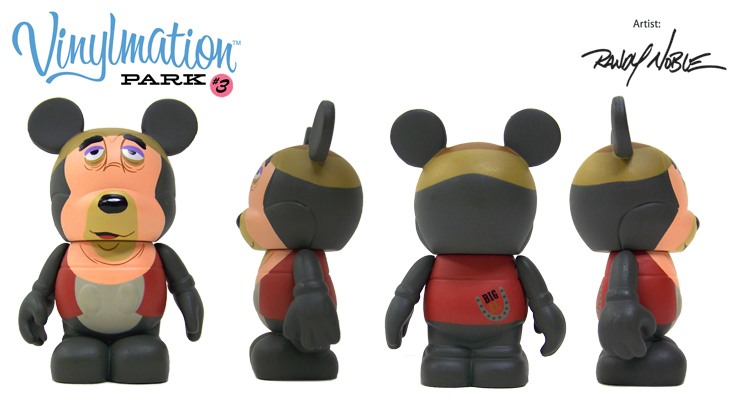 What is Vinylmation? I was thinking the same thing when I first saw these little critters. This past March, I was spending a lovely sunny day browsing through a shop on Disney’s Boardwalk, a deluxe resort next to EPCOT. I was actually looking for a swim suit, which they don’t seem to sell anymore for women. Same with underwear. No swim suits or underwear for us! I guess Disney doesn’t want to think about “lady parts” and wants to completely ignore the fact that when Disneyland first opened the “Wizard of Bras” lingerie shop was operating on Main Street. Anyway, these … things caught my eye. I had no idea what they were. Was it a doll, an action figure, a paperweight? The Cast Member I asked had no idea. I figured they were just the “new thing”. A clever marketing gimic designed to separate us from more of our cash. Little did I know how insidious and genius this marketing gimic was! I admit, it was the pseudo writing theme. I know it’s suppose to depict sketch animation but it was close enough and I thought it would look good on my desk. I went to find it and…..I was perplexed. You see, each series has its own tray that holds about twelve or twenty four smaller boxes. Each box is marked with the series it comes from and nothing else. That’s right, you have no way of knowing which figure is inside the box. Well, that’s easy, I’ll just open the box and see! Nope, now the evil becomes clear. The boxes are all glued shut. There is no way at all to determine which figure is inside which box. Basically, it’s a grab bag. They guarantee that each figure is in the tray, somewhere, along with a “mystery figure” but you have no idea of knowing where it is. Each figure is $10 retail. NOW the plan of Marketing genius raises its head. I must say that even though I hate this with a passion, Disney really needs to give a raise to the person who thought of this idea because from a business stand point, it’s a money spinner. Picture this: Kid walks in to store with parents, sees cool figure and wants it. Wants it bad. Wants it now. Parents buy one but…. yup, it’s the wrong one! Now the melt-down ensures. So they go back to buy another one and another one. Those $10 boxes can sure add up! If you want, they will sell you the whole damn tray so you can have a complete set but that is $120! I know, I know, it’s the bear from the now defunct Country Bear Jamboree and before you start writing me e-mails, I realize that tired show is still going at other parks but it’s dead at Disneyland and that’s what counts. They replaced it with Pooh. Not so sure it was a good trade but at least the tubby little cubby of a bear didn’t sit on Mr. Toad’s Wild Ride, smooshing it into extinction like at Walt Disney World and for that I’m thankful. Update: I just returned from Disneyland a few weeks ago. I went with my sister and her family and guess what they kids wanted? Yup, Vinylmation figures! Did they get the ones they initially wanted? No. Did my sister buy them more? No. The ones they did get they were happy with BUT it seems Disney has instituted a new system. I am assuming it grew out of many a “I got the stoned bear!” tantrum. It is a limited trade rule. Basically there are three figures in a clear case. If you don’t like the figure you picked you can either (a) trade for another grab bag pick but if you don’t like this one you are SOL and no you don’t get to keep both unless you pay for both or (b) you can trade for one of the three figures on display. These figures change each day but if the one you like is in the case, you are sure of getting it. It’s kind of like the lottery that way. Also like the lottery, life rarely works that well. Honestly, it seemed to me the Vinylmations chosen were rarely the “popular” figures. Nine times out of ten, stoned bear is going to be one of the three choices. The moral of this story? Choose at your own risk. To me, Vinylmation figures are the perfect example of shallow American consumerism. Honestly, look at them. Do they do anything? Do they serve any purpose other than instilling in you a need to buy more so you can “collect them all”! People, there are times when collecting something just because the masses are collecting it, doesn’t translate into “collector dollars” down the road unless you operate on a fast turn around schedule. Don’t believe me? Hey, I have a box full of Beanie Babies I can sell you! My advice? Say no to pointless marketing ploys designed to keep you coming back like a crack addict to buy more and more and more. If you want a souvenir go by a plush Mickey or better yet, a shot glass! That has many uses and I highly recommend it. It’s a brilliant idea Disney but I’m not falling for it. I’m going to stuff wax in my ears so I can’t hear your siren’s song as I go about my day. You can keep your tons of pins and trading cards and Vinylmation figures. I’ll just spend my money on something else unless of course you know for SURE which box has the sketch animation figure in it. Posted on August 27, 2010, in Uncategorized and tagged collectibles, disney, figures, marketing, vinylmation. Bookmark the permalink. Leave a comment.